This verse elucidates that God and His angels send blessings and salutations on the Holy Prophet ﷺ . Thus, those who employ various tactics to impede or lessen the advancement of this Prophet will never succeed. Those who make wrong allegations against him and ridicule him presume they can succeed. Their conspiracies cannot harm this beloved of God in any way at all. With the grace of God attainment of the objective for which the Holy Prophet ﷺ was sent will continue to come to pass. Indeed, in this age God sent the true and ardent devotee of the Holy Prophet ﷺ for this attainment and opened new avenues to spread the beautiful teachings of Islam. 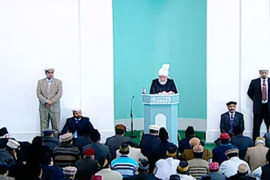 The Holy Prophet (peace and blessings of Allah be on him) was sent for all ages and all nations by God and for this He is facilitating ways and means through His grace. Neither did the Prophet’s opponent succeed in the past nor will they now. This is God’s decree and a true Muslim should not be concerned about this at all. However, true Muslims should be cognisant of the task given to them which is to profusely invoke Durood (salutations and blessings) on the Holy Prophet ﷺ to exalt him just as God and His angels do. To join those who advance the causes of the Prophet ﷺ and along with God and His angels invoke Durood on the Holy Prophet ﷺ People calling themselves Muslim recently attacked the offices of a publication in France and killed 12 people. This was briefly mentioned in last Friday sermon and Ahmadis were urged to invoke Darood. Triumph of Islam will not be through murder and mayhem, rather we will succeed in our objective by invoking Durood on the Prophet ﷺ . It was also mentioned that [the publication] could wrongly react to the attack and this was to be expected of them. They have printed caricatures once again which have caused us hurt yet again as indeed they would hurt any true Muslim. Whatever this publication, called Charlie Hebdo, did a few years ago had been forgotten but the act of those called Muslims ignited it once more. In the past many western leaders had criticised the publication and many governments did not allow re-producing whatever it printed. However after last week’s attacks many sensible leaders have supported it and various sources have helped it with millions of dollars. Its regular circulation was 60,000 and it was on the verge of closing down. Yet, due to people called Muslims five million copies of the magazine are now published. People estimate the publication has been given a new lease of life of further ten to twelve years whereas it may not have lasted six months. Those who attacked the offices of this magazine not only fanned wrongful image of the teachings of Islam but also resurrected a dead enemy. If only Muslim organisations which perpetrate atrocities in the name of Islam understood that the loving teaching of Islam will bring people sooner into the fold of Islam. Worldly people are blind to faith. Let alone the Prophet ﷺ they even mock God. If we respond to ignorance with ignorance we would be committing greater ignorance. God commands to remove oneself from such situations. Socialising with such people or to concur with them makes us sinful but if we respond to their wrong actions with wrong actions and they end up degrading our Prophet ﷺ , this also makes us party to their sin. True Muslims should avoid such practices and leave everything with God Who has stated that when everyone will return to Him they will bear the consequences of such actions. In this age the enemy of Islam harms Islam and the Holy Prophet ﷺ not with force but with such petty ploys. By stating that God and His angels send blessings on the Prophet the principle is explained that these ploys cannot harm the status of the Holy Prophet ﷺ in the least. Rather than react with similar ignorance true Muslims invoke blessings and salutations on the Prophet ﷺ . People who did not think much of this vulgar publication are now supporting it in the name of freedom of speech. However, there are some fair-minded people who did not like the vulgar depictions and have held the management of the magazine responsible. A co-founder of Charlie Hebdo named Henri Roussel has said that images published by the magazine were provocative and its editor dragged the team to death. He has said that this was contrary to their basic policy. Pope has also given a very good statement. He said freedom of speech has limits and religions should be treated with respect so that people’s faiths were not insulted or ridiculed. To illustrate his point Pope said his close friend who organises his tours could expect a punch if he cursed his mother. Indeed, Pope has given a very realistic statement. Muslims should have sense and not react inappropriately. The media is most influential all over the world and plays a role in igniting a given situation and well as diffusing it. After this incident for the first time media approached us and asked Jama’at Ahmadiyya’s views here in the UK and also in other places. We told them this was an un-Islamic act and we expressed our commiseration but we maintained that freedom of speech should have limits otherwise those who inflame others’ sentiments are responsible. Here in the UK Jama’at members appeared on SKY News, News 5, BBC Radio, LBC, BBC Leeds and London Live and in USA on Fox TV and CNN. Canadian newspapers also covered our views as did media in Greece, Ireland, France and various papers in USA. Many interviews were carried out in television studios to convey the true Islamic stance. Here Ameer Sahib as well as Imam Sahib Ata ul Rashed were interviewed on television. In USA, Canada and France our representatives appeared on television and papers carried articles written by Ahmadis. Our teams did a good job of discharging their duties everywhere. A Canadian journalist wrote what could be the reason that in spite of being a small sect of Islam Ahmadiyya have been represented so much in the media and conveyed the real teaching of Islam. It is indeed God’s decree that the Jama’at of the true and ardent devotee of the Holy Prophet ﷺ is to convey the true teaching of Islam to the world. It is our responsibility and every Ahmadi should convey the message within their own sphere that wrong reactions only produce disorder and the global situation will be inflamed spreading all over. Neither people should be provoked by wrong reactions nor should God’s chastisement be called on through them. Ahamdis have to tread the line of: ‘…O ye who believe! you also invoke blessings on him and salute him with the salutation of peace.’ True believers should try their utmost to abide by this. Just as insight increases, understanding of the wisdom behind matters is attained. It is also Islam’s teaching to attain knowledge. When the insight to abide by God’s commandments is attained practice also improves. The Holy Prophet ﷺ said: On the Day of Judgement the person who sends the most blessings on me will be closest to me. He also said: On the Day of Judgement at each dreadful phase of the Day, that person will be closest to me who would have sent the most blessings on me in the world. The Holy Prophet ﷺ said that the Durood of God and His angels was sufficient for him. The practice of invoking Durood is only an opportunity given by God to true believers to garner merit for themselves. Once a man came in the presence of the Holy Prophet ﷺ and offered Salat and then prayed: ‘O God forgive me and have mercy on me. The Holy Prophet ﷺ said to him that he had been a little hasty. He should have instead glorified and praised God, invoked Durood on the Prophet and then supplicated God. The Holy Prophet ﷺ said when you listen to the voice of the muezzin calling for Prayer repeat his words and then invoke Durood on me. The person who invokes Durood has ten-fold blessings from God. The Prophet ﷺ also said seek mediation for me as this is a status from among the ranks of Paradise and will only be granted to one servant of God and I have hope that it will be me. Intersession will be halal for whoever will seek mediation for me. Hazrat Umer (may Allah be pleased with him) said that prayer is suspended between the earth and the heavens and unless Durood is invoked on the Holy Prophet ﷺ , no part of the prayer goes upwards. The Promised Messiah (on whom be peace) laid great emphasis on invoking Durood. Advising one of his followers he said stay focussed in invoking Durood and seek blessings for the Holy Prophet ﷺ with the sincerity and discernment with which one seeks blessings for a dear one. Seek with great humility and there should be no pretence in this humility and prayer. Rather pray for the Holy Prophet ﷺ with the spirit of true friendship and love. Seek those blessings with sincere heart and soul for the Holy Prophet ﷺ which are inherent in Durood. It is a sign of personal love that one never tires, is not disheartened and invokes Durood with no involvement of vested interests and only recites it for Divine blessings for the Holy Prophet ﷺ . The Promised Messiah (on whom be peace) also said although the Holy Prophet is not in need of anyone’s prayers but there is a very profound reason behind invoking Durood. A person who seeks blessings for another owing to personal love becomes a part of them. The beneficence granted to the person for whom blessings are sought is also granted to the person seeking blessings. And because God’s beneficences on the Holy Prophet ﷺ are boundless anyone who invokes Durood on him owing to personal love gets a measure of the boundless blessings. However, very few instances of such spiritual fervour and personal love can be seen. Writing to one of his followers the Promised Messiah (on whom be peace) advised to be profoundly aware that every action is free of being a ritual or force of habit and is instead done with gushing and heart-felt love. For example Durood should not be recited in the parrot-like fashion that people generally do. They neither have absolute sincerity for the Holy Prophet ﷺ nor do they seek blessings for him from God. Rather, it should be one’s creed when reciting Durood that love of the Holy Prophet ﷺ reaches the level where one’s heart would not even suggest to have the same degree of love for another from the start of time till the end or consider that a person could come in the future who could surpass such love. This creed can be established by being prepared to endure all imaginable difficulties with sincerity of heart for his love just as those who loved the Holy Prophet ﷺ endured difficulties out of his love in the past. The heart should not be deterred to endure any imaginable or conceivable hardship and there should be no conceivable commandment from which one would hesitate. One should not have the same love for any other in creation. Once this creed is established Durood should be recited with the objective of invoking God’s complete blessings on His Prophet ﷺ . The Promised Messiah (on whom be peace) said this should be carried out with utmost focus and concentration just like when one prays with concentration when faced with difficulties. In fact one should recite Durood with even greater humility and tenderness and this should have no element of personal fulfilment and one should purely recite Durood to invoke salutations and blessings on the Holy Prophet ﷺ and for his grandeur to illumine in this world and in the Hereafter. Explaining how to identify that one has attained required focus and concentration during Durood the Promised Messiah (on whom be peace) said one sign is that one often weeps during it and feels its impact in the fibre of one’s being and experiences a state in between wakefulness and sleep. O Allah, Bless Muhammad and the people of Muhammad as You did bless Abraham and the people of Abraham. You are indeed the Praiseworthy, the Glorious. O Allah, Prosper Muhammad and the people of Muhammad as You did prosper Abraham and the people of Abraham. You are indeed the Praiseworthy, the Glorious. Hazrat Musleh Maud (may Allah be pleased with him) gave the following perspective about invoking Durood which Huzoor likes a lot. ‘When we pray for others in a way our prayer also becomes a source of elevation of our station. While our recitation of Durood elevates the station of the Holy Prophet ﷺ it also increases our station and blessings reach him and then through him also reach us. For example when something is placed in a sieve it passes through it and cascades down. Similarly God has made the Holy Prophet ﷺ like a sieve for the Ummah. First God grants blessings to him and then those blessings also reach us through his agency. As a result of us invoking Durood God elevates the station of the Holy Prophet ﷺ and certainly God also tells the Holy Prophet that this gift is from such and such believer. This inspires the Prophet ﷺ to pray for us and because of his prayer God grants us a measure of His blessings. Personally speaking when I go to the graveside of the Promised Messiah (on whom be peace) for prayer my way is that I first pray for the Holy Prophet ﷺ and after this I pray for the Promised Messiah (on whom be peace). I then pray, O God, I do not have anything that I could present as a gift to these holy persons. Whatever I have is of no benefit to them. And You have everything, therefore I pray and beseech You to do me a favour and give them a gift in Paradise that they have never received in Paradise before. On this they would definitely ask O Allah! From whom has this gift come? When God informs them who has sent the gift, they pray for the person and thus the person’s station is elevated. It us proven from the Holy Qur’an and Ahadith …no one can deny that prayers are certainly beneficial to the deceased. Huzoor also explained the distinction of the two parts of Durood. In the first part words اللھم صلی علی (O Allah, bless…) are recited. According to lexicon صلی denotes esteem and signifies: O Allah, elevate the name of the Holy Prophet ﷺ in this world and give success and triumph to his message. Grant him greatness through permanence and perpetuation of his Shariah. Grant him greatness in the Hereafter through accepting his intercession for his Ummah and increasing their reward and recompose manifold. In the second part words اللھم بارک علی (O Allah, prosper…) are recited. They signify: O Allah, establish all the respect, greatness, great glory and holiness that You have destined for the Holy Prophet ﷺ and grant it eternity and perpetuity. In summary in اللھم صلی علی the prayer is for the triumph and perpetuation of his Shariah and for the Ummah to receive the beneficence of his intercession. In اللھم بارک علی the prayer is for the eternalness of his honour, greatness, glory and holiness. May God enable us to recite Durood in the true sense and may we attain nearness of God due to it as well as always increase our love for the Holy Prophet ﷺ and may we always expend our capacities in spreading his Shariah. May we always play a positive role in removing disorder from the world according to his teachings! May God always enable us to do so! Huzoor announced two funerals in absentia, those of Maulawi Abdul Qadir Dehlvi Sahib, dervish of Qadian and Mubaraka Begum Sahiba, wife of a dervish of Qadian Bashir Ahmad Sahib Hafizabadi.